The 1980 DCI World Championship Finals at Birmingham, Ala.'s Legion Field witnessed a line-up that for only the second time in DCI's history was comprised entirely of previous finalists. It was quite close at the top, as the 1st place Blue Devils finished only eight tenths of a point above 4th place Spirit of Atlanta, with 27th Lancers and Bridgemen in between. For much of the season, 27th Lancers was thought to possibly become DCI's first Champion from the East Coast, and earlier in the year brought much honor and exposure to drum corps by having a large televised role in the opening and closing ceremonies of the Winter Olympics in Lake Placid, N.Y. Spirit of Atlanta's 1980 season finished with the corps in an enviable 4th place. But the corps' season is instead remembered for the tragedy that shook the entire drum corps world. Just three years prior, Spirit first entered the field. During the following off-season, the corps picked up brass arranger and instructor Jim Ott, who had made a massive splash with the Blue Devils and who also arranged a portion of Spirit's 1977 production. 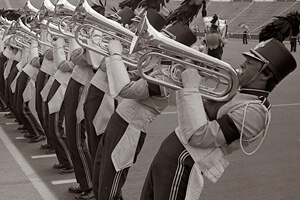 Ott developed an image for Spirit the following season when he introduced a horn line that could melt lead, helping the corps jump into 6th place. The following year, Spirit moved up to 4th place, a feat that was to be replicated in 1980. Tragically on July 8 of that year, as the corps was traveling to a show in Memphis, Ott lost his life in a tragic car accident. Related content: Remembering Jim Ott Related content: A remembrance of Jim Ott's music Following the accident, Spirit of Atlanta headed to Memphis for their scheduled performance. That the corps was able to pull itself together enough to go onto the field to perform a standstill concert in Ott's memory was remarkable enough. But then the entire corps, wearing black armbands, surprised everyone by marching to "Let It Be Me." In the following video from the Memphis event, listen to the audience reaction when they realized what was happening. The titles of three of the repertoire selections performed by Spirit of Atlanta in 1980 included the name "Georgia." The first one was Hoagy Carmichel's "Georgia on My Mind," a brief introductory fanfare written in 1930 by the composer/bandleader. Ray Charles recorded the song in 1960 and 19 years later, he sang it at the Georgia State Legislature. Six weeks later, it was adapted as the official song of the state of Georgia, just a year before the corps played it. While many people logically assume the piece was written about the state, the lyrics by Stuart Gorrell were written as a tribute to Carmichel's sister, Georgia. Next came "Old Man River" by Jerome Kern, with lyrics by Oscar Hammerstein II. The piece was from the 1927 smash hit musical, "Show Boat," about the challenges and hardships of African Americans as viewed by a black worker. It was one of the first commercial successes to tackle the issue of civil rights, even if the theatergoers at the time didn't realize that what was happening. In its original slow and pensive form, it was anything but the high-spirited, up-tempo, happy version played by the Spirit of Atlanta. Of special interest to those interested in musicology is that the melody is based on a pentatonic (five note) scale, which is typically found in Asian themes. The corps' drum solo "The Devil Went Down to Georgia" was based on a popular song from the Charlie Daniels Band's 1979 album, "Million Mile Reflections." It was originally written with no lyrics by bluegrass fiddler Vassar Clements and titled, "Lonesome Fiddle Blues." In Daniels' version, Satan challenged a young fiddler to a contest for ownership of his soul. "Sweet Georgia Brown" served as the corps' standstill concert production. Composed in 1925 by Ben Bernie, Maceo Pinkard, with lyrics by Kenneth Casey, Sr., Spirit's version is the one played by the Count Basie Orchestra on the band's "Prime Time" album of 1977. The back stands at Legion Field. "Let It Be Me," the famous Everly Brothers tune by Johnny Nash from 1960, was originally a French pop tune by Gilbert B?©caud, titled, "Je t'appartiens." The Everly Brothers hold the record for the most Top 100 singles by any duo and were in the first class of inductees into the Rock and Roll Hall of Fame. Spirit performed the piece as the corps' closing number for the third of four years in a row. At the 1978 DCI World Championships in Denver, the spectacular volume of the big company front push pulled fans out of their seats, and they remained standing for the entire last minute of the show. 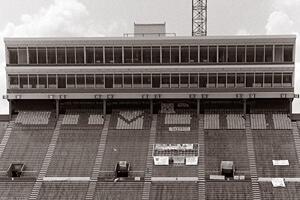 At the DCI World Championships Prelims in Birmingham, a few weeks after Jim Ott's untimely and shocking death, fans in the upper deck of the back stands, utilizing the different color of the stadium seat bottoms compared to the seat backs, spelled out messages of support for individual corps. The messages changed for just about every corps. Then a group spelled out "JIM OTT." That tribute stayed up there for the entire remainder of the Prelims, and it was still up there when fans returned for the Finals competition. As fans left the stadium, the sign remained, reminding all that the memory of Jim Ott—for whom the brass caption award trophy is now named—would remain in the hearts of drum corps fans for decades to come. For this week only, you can save on the Legacy Collection DVD that contains this complete Spirit of Atlanta performance, along with all finalists from the 1980 DCI World Championships. Buy the 1980 Legacy Collection DVD. (Available this week only for 20% off. Regular price: $35.95.) Discount DVD offer ends Monday, Nov. 11 at 8:30 a.m. ET.